David BrownThis month we welcome David Brown as our guest speaker. 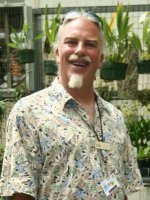 David will present on "A Year at the San Diego Zoo Orchid Greenhouse" in which he will highlight those plants that typically flower in each month. The greenhouse at the San Diego Zoo is open to the public every third Friday of the month as part of the zoo's "Orchid Odyssey". David first attended that event in 1999, and became fascinated with the orchids in the zoo’s collection. "There was so much diversity in shape, size, color and form." he remembers. David came to see the greenhouse as one of the hidden jewel of the zoo and he returned every month after that. Eventually, he met Janette Gerrity, who is in charge of the orchid collection at the zoo. Janette began to mentor him in his new orchid obsession and David also came to know the volunteers who worked there and who shared their information and knowledge with him. After a few years, he knew enough about the orchid collection to become a volunteer himself. Upon a suggestion by other volunteers, he began to attend the meetings of the San Diego County Orchid Society and soon became an active member, later serving as a member of the board and, eventually, as President. The orchid collection at the Zoo consists of about 3000 plants in 300 genera and 800 species. David especially favors the large species collection: "As pretty and intriguing as hybrids are, there is just something about species," he said. During his talk, he will share some of the zoo’s "impressive plants."